Note: The Bolt action is utilized in the design and function of rifles, shotguns and pistols including single shot and magazine-fed repeating models. This illustration exhibits the primary characteristics of a rifle, but most component parts are applicable in a revised configuration. Four magazine configurations available on the repeating models of this type action. Four various safety configurations which may appear on the available models. Two buttstock appointments available in this group. 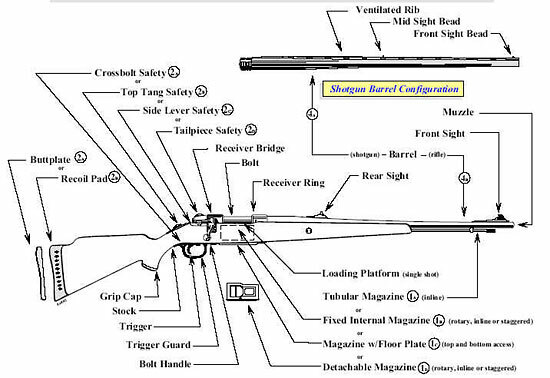 Two barrel configurations which may appear on this type action. Group callouts identify various configurations of a specific component which may be incorporated in the function of the various models employing the bolt action in their design. However, only one type component from each callout group will appear on any given subject firearm.